Up To 240 People Feared Dead In Capsizings Off Libyan Coast : The Two-Way Officials say two boats sank in the Mediterranean, and at least 31 survivors arrived on the Italian island of Lampedusa. This year has been the deadliest ever for migrants crossing the Mediterranean. People board a rescue ship off the Libyan coast in the Mediterranean Sea on Thursday. As many as 240 people are missing and feared to have perished in the Mediterranean Sea after two boats carrying migrants to Europe apparently capsized. A spokesperson for the International Organization for Migration in Italy, Flavio Giacomo, tweeted that at least 29 people had survived, and were brought to the Italian island of Lampedusa. The exact number of people missing has not been confirmed, he said. 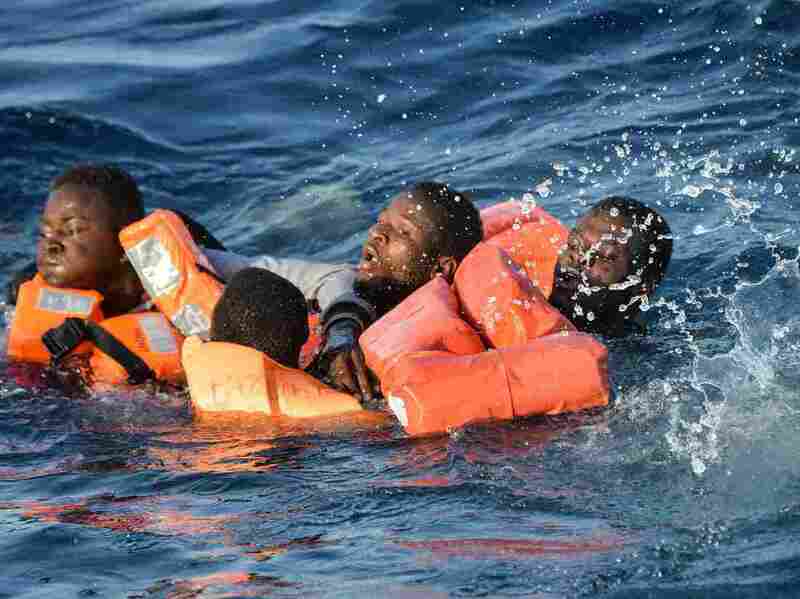 U.N. High Commissioner for Refugees spokesperson Carlotta Sami told The Associated Press that two more people had been rescued, bringing the number of survivors to at least 31, and that most of the people on the vessels appeared to have been sub-Saharan Africans. NPR's Jane Arraf reports that, according to survivors, one of the boats was an overcrowded rubber dinghy that capsized just hours after it left Libya on Wednesday, and that at least six children and 18 women — some of them pregnant, were believed to have drowned. People struggle in the water during a rescue operation of a rescue ship run by Maltese NGO Moas and the Italian Red Cross off the Libyan coast. 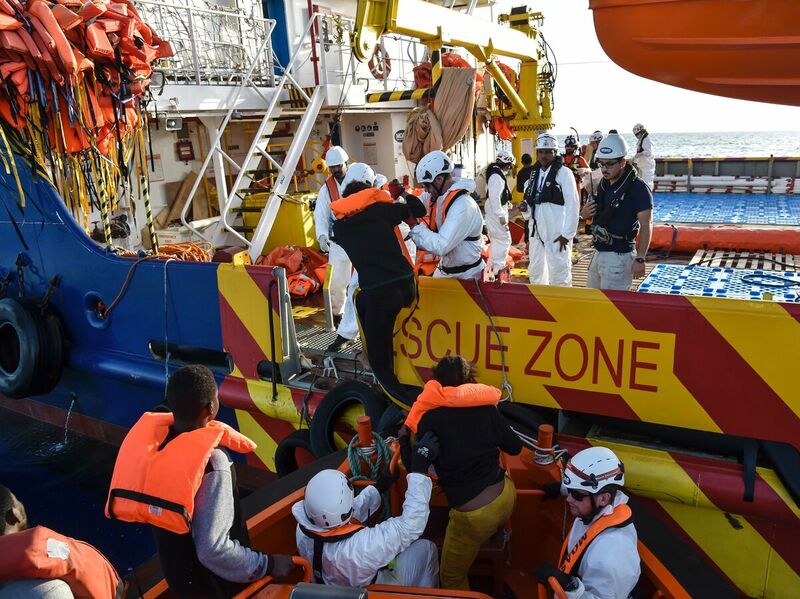 Images of the rescue by the Italian Red Cross and other NGOs showed people struggling in the water before being pulled to safety. As The Two-Way reported last week, the U.N. refugee agency had already announced that 2016 is set to be the deadliest year ever for migrants crossing the Mediterranean. William Spindler, spokesman for the U.N.'s refugee agency, told reporters that the likelihood of dying while making the journey has dramatically increased since last year. "From one death for every 269 arrivals, last year, in 2016 the likelihood of death has spiraled to one in 88," he said. "On the Central Mediterranean route between Libya and Italy the likelihood of dying is even higher, at one death for every 47 arrivals." With the most recent catastrophe, the scenario forecast by the U.N. has come to pass. The total number of people dead or missing in the Mediterranean this year is more than 4,200, according to the most recent numbers compiled by the IOM and published Thursday morning. That is well over the 3,771 people the IOM counted as dead or missing in the Mediterranean last year, or the 3,279 people the agency counted in 2014. On Thursday, Amnesty International released a report on treatment of migrants by Italian authorities. The report was based on interviews with 174 people at migrant reception centers, including on Lampedusa, where the most recent survivors were taken by rescuers. The report alleged "excessive use of force by police, arbitrary detention and collective expulsions" by Italian authorities, and blames some of the treatment on the European Union's so-called hotspot approach to documenting new arrivals to Europe by rapidly identifying and fingerprinting them at their point of entry in the EU. The report described authorities who are under pressure from the EU to fingerprint 100 percent of migrants arriving in Italy, assaulting some migrants who refused to provide fingerprints. Among the report's conclusions was the recommendation that Italy deploy "independent monitors to oversee the screening process."